The Boeing KC-97 Stratofreighter is a United States strategic tanker aircraft based on the Boeing C-97 Stratofreighter. It was succeeded by the Boeing KC-135 Stratotanker. The KC-97 Stratofreighter was an aerial refueling tanker variant of the C-97 Stratofreighter (which was itself based on the Boeing B-29 Superfortress), greatly modified with all the necessary tanks, plumbing, and a flying boom. The cavernous upper deck was capable of accommodating oversize cargo accessed through a very large right-side door. In addition, transferrable jet fuel was contained in tanks on the lower deck (G-L models). Both decks were heated and pressurized for high altitude operations. Note: Occasionally the KC-97 has been referred to as "Stratotanker". However, all reputable sources refer to the KC-97 as Stratofreighter, not -tanker. This includes both Boeing and the USAF themselves. Two USAF A-7 Corsair IIs refueling from a KC-97. 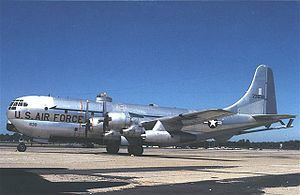 The USAF began operating the KC-97 in 1950. It purchased a total of 811 KC-97s from Boeing, as opposed to only 74 of the C-97 cargo version. The KC-97 carried aviation gasoline for its own piston engines but it carried jet fuel for its refueling mission, this required an independent system for each type of fuel. However, it was able to offload its aviation gas to a receiver in an emergency in a procedure known as a "SAVE". These tankers were vitally important to the world-wide Boeing B-47 Stratojet strategic operations. An example was the support of Arctic reconnaissance flights from Thule Air Base. While it was an effective tanker, the KC-97's slow speed and low operational altitude complicated refueling operations with jet aircraft. B-52s typically lowered their flaps and rear landing gear to slow the aircraft enough to refuel from the KC-97. In addition, a typical B-52 refueling engagement profile would involve a descent that allowed the aircraft pair to maintain a higher airspeed (220–240 knots). In the early 1960s, the Tactical Air Command added General Electric J47 two twin- jet pods from retired KB-50 aerial tankers to produce the KC-97L. These jet pods increased the speed of the KC-97 (for short periods of time) and made it more compatible with jet fighter planes like the F-84, F-100, and F-101. In 1956, the Strategic Air Command began phasing out its KC-97s in favor of the KC-135 Stratotanker. KC-97s continued flying with Tactical Air Command, the Air Force Reserve, and the Air National Guard. The rest of the KC-97s were retired completely in 1978, when the Texas Air National Guard and the Utah Air National Guard exchanged their KC-97Ls for the C-130 Hercules and the KC-135 Stratotanker, respectively. This modified KC-97, constructed in 1953, was eventually purchased by NASA in 1997. It is still in service supporting NASA, other Federal agencies, and Federal contractors. It is one of two KC-97s left still in flyable condition, the other being former KC-97G 52-2718, "Angel of Deliverance", currently flown by Berlin Airlift Historical Foundation as YC-97A 45-59595. Three C-97As were converted into aerial refueling tankers with rear loading door removed and a flight refueling boom added. After the design was proven, they were converted back into the standard C-97A. aerial refueling tankers with rear loading doors permanently closed, 60 built. Some were later converted into transports as the C-97E. 3800hp R-4360-59B engines and minor changes, 159 built. Some were later converted into transport as the C-97F. Dual-role aerial refueling tankers/cargo transportation aircraft. KC-97G models carried underwing fuel tanks. 592 built. ELINT conversion of three KC-97Gs. 53-106 was operated by the Central Intelligence Agency for covert ELINT operations in the West Berlin Air Corridor. 135 KC-97Gs converted to transports. Five KC-97Gs were used as ground instruction airframes. One aircraft was modified to test the underwing General Electric J47-GE-23 jet engines, and was later designated KC-97L. KC-97Gs converted for search and rescue operations, 22 converted. One KC-97F was experimentally converted into a hose-and-drogue refueling aircraft. two KC-97G conversion with four 4250 kW Pratt & Whitney YT34-P-5 turboprops, dropped in favour of the Boeing KC-135 Stratotanker. 27 KC-97Gs converted to troop transports. 81 KC-97Gs modified with two J47 turbojet engines on underwing pylons. 27 June 1954 – KC-97G AF Ser. No. 52-2654 which departed from Altus Air Force Base, Oklahoma, encountered poor weather at its destination, March Air Force Base in California, and attempted to divert to Norton Air Force Base, but crashed into Box Springs Mountain north of Riverside, California, killing all 14 people on board. 22 January 1957 – a KC-97G AF Ser. No. 53-0222 from Griffiss Air Force Base, New York, crashed in the foothills of the Adirondack Mountains, killing its crew of seven. 9 May 1957 – KC-97F AF Ser. No. 51-0258 en route from Sidi Slimane Air Base, Morocco, to Lajes AB, Azores, ditched in the Atlantic 550 km (343.8 mls) SE of the Azores Islands following a double engine failure. All seven crew survived. The airplane floated for ten days before being sunk by the battleship USS Wisconsin. 18 July 1957 – KC-97G AF Ser. No. 52-2737 from the 380th Air Refueling Squadron with a crew of eight, exploded and crashed into Lake Champlain at 2128 hrs., when two of the four engines failed three minutes after take-off from Plattsburgh AFB, New York. There were three survivors. 29 October 1957 – KC-97G AF Ser. No. 52-2711 of the 509th Bomb Wing, out of Walker AFB, New Mexico, crashed 35 miles north of Flagstaff, Arizona, while on a nine-hour low-level survey flight to determine minimum altitude restrictions for B-47 training routes. The aircraft was seen over Gray Mountain, Arizona, at altitude of 60 feet shortly after 0830 hrs., and then heard striking a cloud-shrouded cliff face, killing 16 crew and strewing wreckage for 200 yards along mountainside. 22 July 1959 – KC-97 AF Ser. No. 52-2703 of Pease Air Force Base crashed near Andover, New Hampshire, while on a nighttime training mission; all seven crewmen were killed. 14 December 1959 – KC-97G AF Ser. No. 53-0231 of the 384th Air Refueling Squadron, out of Westover AFB, Massachusetts, collided with a B-52 during a refueling mission at an altitude of ~15,000 feet. The aircraft lost the whole left horizontal stabilizer and elevator, the rudder, and the upper quarter of the vertical stabilizer. The crew made a no-flap, electrical power off landing at night at Dow AFB, Maine; seven crew okay. "Spokesmen at Dow Air Force, Bangor, said the B52 [sic] apparently 'crowded too close' and rammed a fuel boom into the tail of a four-engined KC95 [sic] tanker plane." Aircraft stricken as beyond economical repair. Two crew on the B-52 ejected, parachuted safely, and were recovered by helicopters in a snow-covered wilderness area. The bomber and remaining eight crew safely landed at Westover AFB. 30 March 1960 – KC-97 AF Ser. No. 51-0363 (Manufacturer's Serial Number 16430) ditched and sank off Cape Canaveral. This particular aircraft was lost due to engine failure. The crash resulted in 3 fatalities of the 14 crew. The wreck of the aircraft was discovered June 6, 2015, in 365 feet of water by divers. 15 April 1960 – KC-97G AF Ser. No. 52-0919 of the 307th Air Refueling Squadron, 307th Bomb Wing, crashed on take-off from Lincoln AFB, Nebraska, after the undercarriage collapsed. All 24 on board survived, with two airmen suffering leg fractures and five others with minor cuts and burns. 27 June 1960 – KC-97G AF Ser. No. 52-2728 of the 380th Air Refueling Squadron, Plattsburgh AFB, New York, suffered failure of lubrication on an engine impeller shaft during an evening four-hour training mission to refuel a Boeing B-47 Stratojet. During rendezvous at 15,500 feet, the tanker's number one (port outer) powerplant caught fire. As the bomber moved away from the burning tanker, the crew tried unsuccessfully to put out the blaze. The plane went into a spin as the wing failed outboard of the engine; the aircraft crashed on Jonathan Smith Mountain, a hill east of Puzzle Mountain in Newry, Maine. The flash of the fire was seen from as far away as Lewiston and Bridgton. All five crew were killed. Wreckage covering five acres was still there as of 2010. 5 November 1964 – KC-97 AF Ser. No. unknown of Pease Air Force Base crashed on takeoff; all five crewmen were killed. 17 September 1971 – KC-97G IAF Serial 4X-FPR/033 of the Israeli Air Force, was shot down by Egyptian missiles over Suez, Egypt; seven of eight-man crew were killed. A number of KC-97s survive, at least two of which are potentially airworthy: 52-2718 / N117GA Angel of Deliverance is currently airworthy and operated by the Berlin Airlift Historical Foundation., and N1365N known as Tanker 97 and operated until about 2004 as an aerial firefighting airtanker by Hawkins & Powers. 52-0895–Rogue Valley International-Medford Airport in Central Point, Oregon, registered as N1365D. 52-0905– Wisconsin National Guard Museum at Volk Field Air National Guard Base in Camp Douglas, Wisconsin. 52-2624– At the now-closed Florence Air & Missile Museum, Florence Regional Airport, Florence, South Carolina. 52-2630– National Museum of the United States Air Force at Wright-Patterson Air Force Base near Dayton, Ohio. 52-2694– Located at Grant County International Airport, Moses Lake, Washington. Seen wearing civil registration N31338. 52-2697– Grissom Air Museum at Grissom Air Reserve Base (former Grissom AFB) in Peru, Indiana. 52-2736– Israeli Air Force Museum adjacent to Beersheba, Israel. 52-2961– Located in Greybull, Wyoming, registered as N29862. 53-0151– Pima Air and Space Museum adjacent to Davis-Monthan Air Force Base in Tucson, Arizona. 53-0198– Strategic Air Command & Aerospace Museum near Ashland, Nebraska. 53-0218– Minnesota Air National Guard Museum, St. Paul, Minnesota. Displayed in C-97G configuration. 53-0230– Air Mobility Command Museum at Dover Air Force Base, Delaware. 53-0240– Barksdale Global Power Museum at Barksdale Air Force Base, Louisiana. 53-0280– Tail section preserved in Zruč nad Sázavou, Czech Republic, registered as N49548. 53-0282– Dyess Linear Air Park at Dyess Air Force Base in Abilene, Texas. 53-0283– The Airplane Restaurant adjacent to Peterson Air Force Base and Colorado Springs Municipal Airport in Colorado Springs, Colorado. 53-0298– Museum of Aviation at Robins Air Force Base in Georgia. 53-0327– Whiteman Air Force Base in Knob Noster, Missouri. 53-0335– Carolinas Aviation Museum north of Charlotte Air National Guard Base at Charlotte-Douglas International Airport in Charlotte, North Carolina. 53-0354– Castle Air Museum at the former Castle Air Force Base in Atwater, California. 53-0363– March Field Air Museum at March Air Reserve Base (former March AFB) in Riverside, California. 53-0360– Malmstrom Museum, Malmstrom Air Force Base, Montana. Displayed as 52-2638. TK1-3– Museo del Aire (Spain) at Cuatro Vientos Airport in Madrid, Spain. Former USAF aircraft, AF Ser. No. 53-0189. The KC-97 Stratofreighter is shown in both its cargo and tanker tasks in the 1955 film Strategic Air Command, refueling a B-47 in flight, and in the 1957 film Bombers B-52, refueling B-52s. Data from USAF Museum and FAS. Capacity: 9,000 gal (34,000 L) of 115/145 fuel. ^ Swanborough / Bowers 1989, p. 128. ^ a b Swanborough / Bowers 1989, p. 127-129. ^ "Boeing: Historical Snapshot: C-97 Stratofreighter". www.boeing.com. Archived from the original on 24 February 2015. Retrieved 29 April 2018. ^ "Factsheets : Boeing KC-97L Stratofreighter". archive.org. 27 June 2015. Archived from the original on 27 June 2015. Retrieved 29 April 2018. ^ Bowers 1989, p. 358-359. ^ Bowers 1989, p. 353-358. ^ Swanborough / Bowers 1989, p. 125-126. ^ Bowers 1989, p. 364. ^ Rarenstein, Charles. Air Force combat wings: lineage and honors histories, 1947–1977. Office of Air Force History, U.S. Air Force. ISBN 0-912799-12-9. ^ Ranter, Harro. "ASN Aircraft accident Boeing KC-97G-25-BO Stratofreighter 52-2654 Riverside-March AFB, CA (RIV)". aviation-safety.net. Archived from the original on 24 April 2015. Retrieved 29 April 2018. ^ Ranter, Harro. "ASN Aircraft accident Boeing KC-97G Stratofreighter 53-0222 Rome-Griffiss AFB, NY (RME)". aviation-safety.net. Archived from the original on 13 February 2016. Retrieved 29 April 2018. ^ "Nobleboro, NY Air Force Tanker Crashes, Jan 1957 - GenDisasters ... Genealogy in Tragedy, Disasters, Fires, Floods". www3.gendisasters.com. Archived from the original on 5 March 2017. Retrieved 29 April 2018. ^ Ranter, Harro. "ASN Aircraft accident Boeing KC-97F-55-BO Stratofreighter 51-0258 Azores Islands". aviation-safety.net. Archived from the original on 9 July 2015. Retrieved 29 April 2018. ^ Strategic-air-command.com: Plattsburgh AFB, NY – SAC – 380th Bomb Wing – B-47, B-52, FB111A Archived 2016-03-06 at the Wayback Machine Retrieved on 2011-12-1. ^ a b c d e "1952 USAF Serial Numbers". www.joebaugher.com. Archived from the original on 8 August 2011. Retrieved 29 April 2018. ^ "Accident description". aviation-safety.net. Archived from the original on March 5, 2017. Retrieved June 30, 2017. ^ "Eight Die As Tanker Plane Falls". Orlando Sentinel. AP. July 23, 1959. Archived from the original on April 29, 2018. Retrieved June 30, 2017 – via newspapers.com. ^ Ferraro, Peter (2014). "Site of 1959 Plane Crash Receives an American Flag". Andover Beacon. Andover, New Hampshire. Archived from the original on April 29, 2018. Retrieved July 1, 2017 – via newspapers.com. ^ Associated Press, "Two Chutists Found Safe", Lincoln Evening Journal and Nebraska State Journal, Tuesday 15 December 1959, page 3. ^ "KC-97 Stratofreighter underwater wreck found". websitetoolbox.com. Archived from the original on 29 April 2018. Retrieved 29 April 2018. ^ "Member Photos2". www.307bwassoc.org. Archived from the original on 3 March 2016. Retrieved 29 April 2018. ^ Ignasher, Jim (May 6, 2016). "Pease Air Force Base – November 5, 1964". newenglandaviationhistory.com. Archived from the original on April 29, 2018. Retrieved June 30, 2017. ^ "5 Are Killed as Air Force Tanker Falls". Chicago Tribune. AP. November 6, 1964. Archived from the original on April 29, 2018. Retrieved June 30, 2017 – via newspapers.com. ^ "ASN Wikibase Occurrence # 185180". aviation-safety.net. Archived from the original on April 29, 2018. Retrieved June 30, 2017. ^ Ranter, Harro. "ASN Aircraft accident Boeing KC-97G Stratofreighter 4X-FPR/033 Suez Canal". aviation-safety.net. Archived from the original on 17 March 2012. Retrieved 29 April 2018. ^ "Berlin Airlift Historical Foundation". www.spiritoffreedom.org. Archived from the original on 1 August 2001. Retrieved 29 April 2018. ^ "KC-97L STRATOFREIGHTER - Grissom Air Museum". www.grissomairmuseum.com. Archived from the original on 29 April 2018. Retrieved 29 April 2018. ^ "Aircraft Data 52-2736, 1952 Boeing KC-97G Stratofreighter C/N 16767". www.airport-data.com. Archived from the original on 29 April 2018. Retrieved 29 April 2018. ^ User, Super. "STRATOFREIGHTER". www.pimaair.org. Archived from the original on 24 February 2015. Retrieved 29 April 2018. ^ "KC-97G "Stratofreighter" – Strategic Air Command & Aerospace Museum". www.sasmuseum.com. Archived from the original on 10 March 2015. Retrieved 29 April 2018. ^ "BOEING C-97G STRATOFREIGHTER - Exhibits - Minnesota Air National Guard Museum". mnangmuseum.org. Archived from the original on 14 August 2016. Retrieved 29 April 2018. ^ "KC-97L Stratotanker - Air Mobility Command Museum". amcmuseum.org. Archived from the original on 5 October 2016. Retrieved 29 April 2018. ^ a b c d e f "1953 USAF Serial Numbers". www.joebaugher.com. Archived from the original on 9 June 2011. Retrieved 29 April 2018. ^ "Aviation Photo #1008646: Boeing KC-97L Stratofreighter (367-76-66) - USA - Air Force". Airliners.net. Archived from the original on 4 March 2016. Retrieved 29 April 2018. ^ "Aviation Photo #1299816: Boeing KC-97L Stratofreighter (367-76-66) - USA - Air Force". Airliners.net. Archived from the original on 3 March 2016. Retrieved 29 April 2018. ^ "KC-97 Stratotanker". Federation of American Scientists WMD Resources. Archived from the original on 2012-10-06. Retrieved 2011-12-02. Bach, Martin: Boeing 367 Stratofreighter, Boeing 377 Stratocruiser, Aero Spacelines Guppies. NARA Verlag, Allershausen 1996, ISBN 3-925671-18-8. Bowers, Peter M.: Boeing Aircraft since 1916. Putnam Aeronautical Books, London 1989, ISBN 0-85177-804-6. Swanborough, Gordon and Bowers, Peter M.: United States Military Aircraft since 1909. Putnam Aeronautical Books, London 1989, ISBN 0-85177-816-X. Wikimedia Commons has media related to Boeing C-97 Stratofreighter.